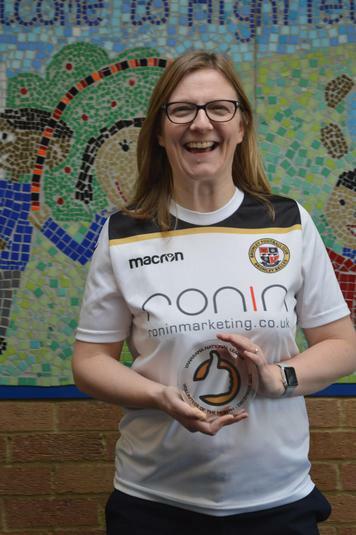 Massive congratulations are extended to, Mrs Ellis, Infant School PE Lead and Year One Year Group Leader who has won December’s National League Volunteer of the Month award, for her work in women’s football. Last March, Mrs Ellis decided to establish a new women’s team in Bromley targeting the over thirties. The Bromley Belles now has a core of regular attendees. The team is open to beginners and those returning to the game. Training takes places every Wednesday evening. By enlisting the support of Bromley FC she has helped to secure funding for the project from The National League Trust; money which will help the Club progress, with support of a qualified coach, pitch hire and equipment. If you are interested in finding out more contact Bromley Belles by email bromleybelles@bromleyfc.co.uk or find them on Facebook/Twitter.